NK Forster Hexham workshop robbed – guitars stolen! Well, today I actually planned to send out a newsletter to tempt you all with a mandola that was made for a chap in the USA. Sadly, due to financial problems, the chap had to cancel his order. About an hour after I wrote the newsletter, I received a phone call from my pal Ralph Plumb – I’m sharing a workshop with Ralph at the moment, finishing off a load of instruments before moving country (yet again) later in the year. Ralph rang me to say the workshop (our workshop) had been broken into early this morning, that the Police were there and that he was on his way to pick me up to see what was missing. Here is a list of what was taken. Please share this on social media, the thieves are going to struggle to sell any of this without raising alarms. Even if you’re not in the UK, please share this news, as Facebook algorithms are much more likely to show this in a newsfeed in the UK when people share it. The thieves who did this are going to struggle to “move” this lot on without setting off the alarm bells, so it’s possible they will end up dumping them or destroying them all. But you never know, I may get them back. And if that is the case, there will be a sigh of relief from quite a few folk. Here is the list. Some of these had already been paid for and were about to be sent out. Others were the “Available Now” stock for the next 12-18 months. Those who have sent funds will be refunded later this week. Fingers crossed, they’ll turn up. The workshop is in Hexham, Northumberland, so Newcastle, Sunderland, County Durham, Northumberland and Cumbria are the most likely places for the gear to be found. But you never know. Wherever you are, please let me know if you see anything. 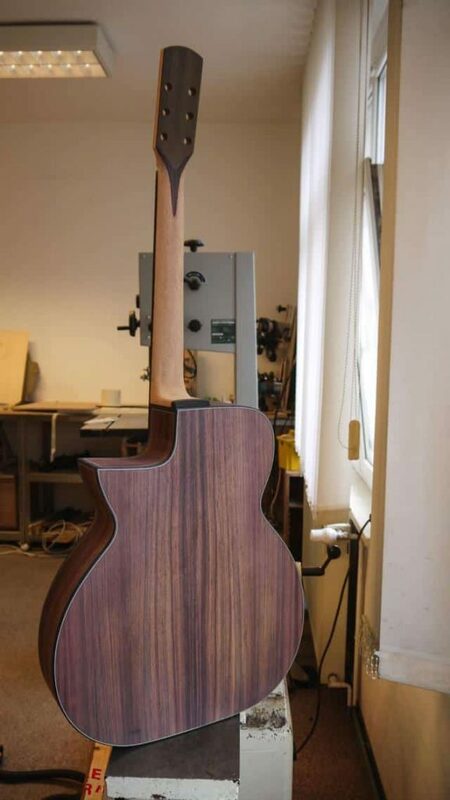 NK Forster Indian rosewood/spruce Model C-SS w/cutaway – this is the only one I don’t have a photo of finished. This lot represents about 8 months work. A lot of time, and a lot of money. A lot of care, and a lot of effort. Ironically, it was yesterday afternoon that I closed the doors to the workshop, glad I’d finally finished setting up the whole lot. Done. Several were going to be shipped out to customers this week, the rest were going to my secure lockup in Newcastle on Monday. Please spread the word. Even if you are not in the UK – you can boost the visibility of this page by sharing and linking.